Are you looking for an exciting event for young and old? Talk to us about scheduling a Border Collie herding demonstration at a location of your choice. Connie and John and the Border Collies of Heatherhope have delighted thousands of children and adults at demonstrations at such places as Kline Creek Farm in West Chicago, the Sandwich Fair (Illinois’ oldest county fair), Downers’ Grove (for the Historical Museum), Naper Settlement in Naperville, the Glen Ellyn and Carol Stream Park District dog events, and Cantigny in Wheaton—all in Illinois. Of course, demonstrations can also be scheduled for Heatherhope Farm in Sycamore. 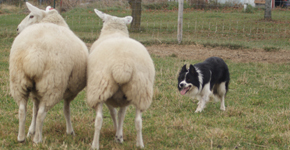 For each demonstration Connie gives a commentary while John and the dogs show off the kind of moves that have made Border Collies such trusted and versatile partners in caring for sheep all over the world. They also demonstrate what it takes to train dogs, building on their amazing instincts and developing a partnership that is both inspiring and practical. Since each situation is unique, please contact the Seraphines to discuss pricing for a demonstration. They can provide a high quality portable address system, explanatory brochures, the sheep, and all necessary equipment. In case your space is very limited it may also be possible to demonstrate herding with ducks instead of sheep.